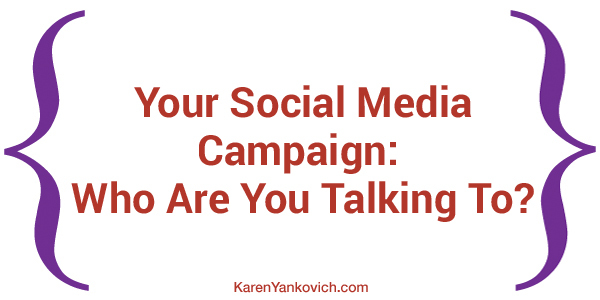 Your Social Media Campaign: Who Are You Talking To? I have a very important question to ask you. It’s a question I ask all of my clients, and it’s usually the first question I ask when I take them on. I ask: Within your social media, exactly who are you talking to? You might think I’m referring to: clients, customers, business partners etc. I’m referring to the personification of your ideal client. Often I ask my clients: “So show me the profile of your ideal client.” And they might stammer a little, or pause for a long time, and then launch into some basic ideas about age and gender and buying habits. And while that is a start, that’s not really what I mean. In order to have a solid, profitable social media campaign you need to first do some homework. So…who are you talking to? Five questions to answer in order to build a solid profile of your ideal client. 1. How would you talk to your ideal client in a conversation? This helps because now you know a) where to find them and where to focus your energies and b) how to communicate, even who to hire to help you communicate if your personal communication style is vastly different. 2. What does your ideal client take time to read online and off? Healthcare blogs or inspirational blogs or follow news blogs every day? Creating Pinterest boards of ideas for recipes, travel plans, or exercise ideas? Reading what people post in group discussion boards or the latest trending youtube videos and their comments? This is important to you because now you know a) where to guest post to reach this audience, b) what to create (videos, memes etc) next in your social media campaign and c) what to follow and comment on. 3. What does your ideal client think about everyday? agonize over decisions about health and wellness? wish they had help with finances and budgets? hope and dream about becoming their own boss someday? This is helpful to know because now you can pinpoint your ideal clients anxieties and stressors and address these specifically in valuable web content, blog posts, newsletters and the like. 4. How does your ideal client define success? ability to be at the top of their game? This is helpful because you can now tell your prospect client exactly what they will achieve that speaks directly to their definition of success. You are speaking their language in your web copy, social media advertising, email marketing and defining your products and services in terms they understand and more importantly defining your offerings in specific ways that show them it fulfills what they need. 5. You found your ideal client’s journal, what does it say? Yes this is a tricky one, but well worth the effort if you take the time to dive deep here. You can use this information to craft tweets, posts, LinkedIn updates or even the best connection letter you could ever create that hits home each and every time. deep dark fears and anxieties? past traumas and events they overcame? fantasy solution to a problem they are deal with? This is helpful to you because now you can address their exact pain points and fears. You can craft products and services that solve these problems and really start to be a valuable expert in helping people create better lives. And that’s ultimately why we are all in business isn’t it? When you have crafted this profile of your ideal client, along with the basics of age, gender, hangouts and salary your social media campaign can really expand, dive deep and get results. Which is ultimately what we want in business isn’t it? Do you have questions about how to craft your social media campaign or create your ideal client profile? Join me in my LinkedIn group where you can get answers to these questions and more! WOW ! Great tips and techniques for deep diving into what your target market people look like. You did an in-depth study of specifics. Thanks Karen!